Peel ginger and garlic and add to food processor with curry paste, juice from half the lime, coconut milk, soy sauce, and honey. Process to a sauce. Cut the other half of the lime into small wedges and set aside for serving. Wash cilantro, chop roughly, and set aside. Cut chicken breast into strips and place in medium bowl. Pour in just over half of the sauce and some of the sesame oil into the bowl with the chicken. Mix to combine, and cover with plastic wrap. Rest for at least 2 hrs. or overnight in the fridge. Mix the remaining sauce with peanut butter, water, remaining sesame oil, and salt in a small bowl to make the peanut sauce. Add more water if needed to get the consistency you desire. Thread chicken onto skewers. Heat vegetable oil on medium in grill pan. Cook skewered chicken in hot pan for approx. 8 – 10 min. per side, or until chicken is cooked all the way through. Sprinkle with sesame seeds. 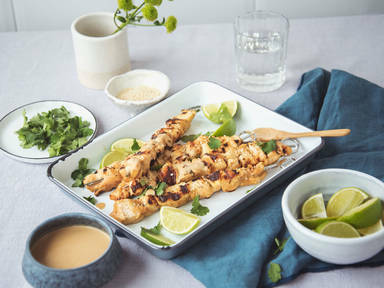 Serve skewers with peanut sauce, lime wedges, and cilantro. Enjoy!